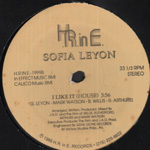 The selection here covers house's most creatively vital period from the late eighties to early nineties when, particularly in the UK, the house and rave scene was huge. While the house sound was being jacked in Chicago, New York and New Jersey continued to make soulful dance records but embraced the growing production technologies available (and taking some influence from their peers in the Windy City). 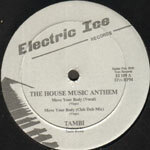 This is evident in the fact that while we in England were calling these records 'house', in NY and Jersey they referred to it simply as 'club' music, as they had referred to most dance music played in the clubs throughout the eighties. Of course these records don't compare to the slickness of most of today's house productions but there is an innocence and rawness to many of these records which were made before house and the club scene became big business. From early soulful vocal tunes by groups like Blaze and Ten City to the more raucous sounds of Todd Terry and early Nu-Groove releases many timeless tunes were made. So if you are looking for a strong vocal club cut or a classic tune to take you back to the heady years of the house scene you should find something here of interest. Classic early raw Garage sound produced by Timmy Regisford & Boyd Jarvis! This was big in the early house scene in the UK - based on a tune by SIMPLE MINDS! NU GROOVE 12 inch - £8 Nr. Mint in shrink! Classic East Coast deep house sound from 1990! East coast cover version of the Chicago classic! 4 cut various artists EP Inc. Rasoul / Ron Trent & Charles Webster / Etc..
Great early garage production from Boyd Jarvis & Timmy Regisford from 1986 strong vocal still sounds fresh! Sound of 88 house features spoken word from the godfather movie! Deep House East coast style from 1987 mixed by Timmy Regisford - Garage vibes!